#262. 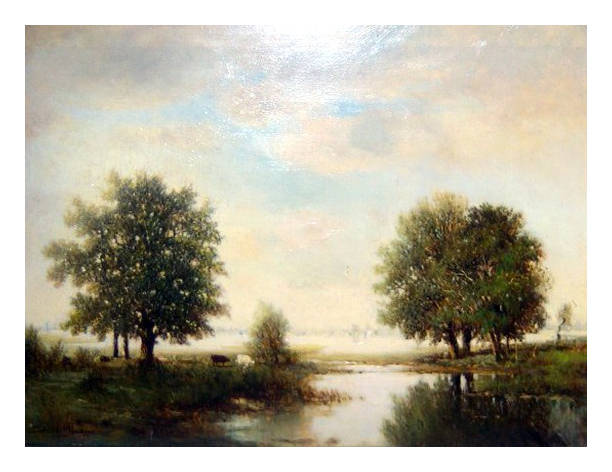 Untitled Barbizon Landscape. 12 x 16, oil on beveled board. "Gilbert Munger" lower left. 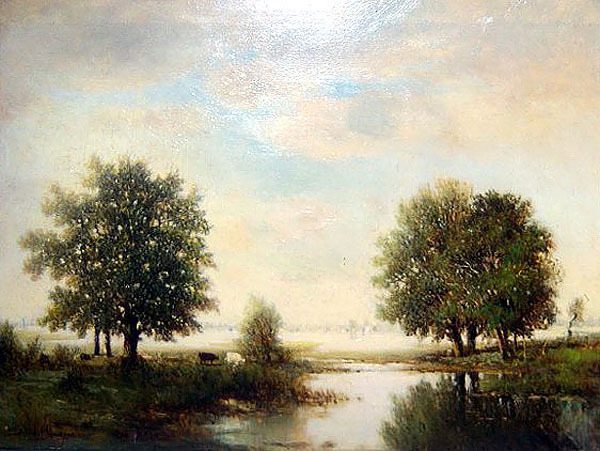 A Barbizon landscape reminiscent of others. Owned by William D. Innes, principal in the Stearman Aviation Co. of Wichita KS; in the estate of his son William D. Innes, of Sun Valley ID, when he died in 2008. The frame is original as is the dust cover on the back. A label on the dust cover shows "20889 Newcastle on Tyne". Underneath the dust cover is a sticker from "Mawson, Swan & Morgan Limited, Picture Frame Makers, Fine Art Dealers, and Printsellers, Crainger's Street West, Newcastle-On-Tyne" and a partial sticker showing "Fine Picture Framing, Number 2080, Size 12 x 16, Subject Landscape, and Artist Gilbert Munger". Image from the estate appraiser's email.